Understand why you need to determine the audience and purpose for an app. Determine the audience and purpose for the example app. Even a cursory look at The Motivator was enough to tell you that it needs work. With all due respect to your predecessor, something about it just isn’t right. You’ve stepped away from the immediate problem of redoing the app to think about its design. You’ve learned principles of design and a process you can use to reflect those principles in your development work. And now you’re ready to follow that process. What’s your next step? Determining the purpose of The Motivator. Specifically, you need to identify an audience for the app, and why the audience would use it—what it does for them that they can’t do in another way. In other words, you need to determine the who and the why of the app. Without that, you don’t have a starting point. Yes, your predecessor knew her way around data. She had a good understanding of how to get data into Analytics and how to edit the dataflow so it included just the right data in the right structure. She had a good feel for creating dashboards. But she didn’t think about what anyone would actually do with those dashboards. So the best result she could hope for was a hodgepodge of cool-looking charts that may or may not have answered any questions the sales team had about its data. You decide to find out from a few sales managers what they need to know about reps’ activities to keep the business moving forward. Before your meeting, set up your own version of The Motivator in a special Trailhead Developer Edition org. A free Developer Edition org is a safe environment where you can learn and practice new skills. You definitely need one as you work with the Motivator app. Also, run the Motivator dataflow to be sure data appears correctly in dashboards. For this trail, you can’t use an existing Developer Edition org or a Trailhead Playground org. You have to use a special Analytics-enabled Developer Edition org instead. You must sign up for this special Developer Edition because it comes with a limited Analytics Platform license and contains sample data required for this Analytics trail. Let’s get you set up so you can log in and start working with Analytics. Fill out the form using an active email address. Your username must also look like an email address and be unique, but it doesn’t need to be a valid email account. For example, your username can be yourname@waverocks.de, or you can put in your company name. Write down or remember your credentials. To log in, go to login.salesforce.com. Click Save. You’re now logged in to your new Analytics Developer Edition org complete with DTC Electronics data. Next, run the dataflow to be sure the data you analyze at is up-to-date. Go to Analytics by clicking the app launcher ( ) in the upper left corner. Then click the Analytics Studio tile. If Analytics Studio doesn’t open, check to see if your pop-up blocker is on. If so, change the setting to allow pop-ups from your org. That takes you to the Analytics Studio home page. Under Monitor, select Dataflows. To the far right of The_Motivator, click the triangle, and select Run Now. Under Monitor, click Jobs to see the status of the dataflow. 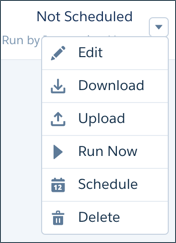 The blue Running message changes to a green Successful when the dataflow finishes running. That’s it! Your org’s all set up with fresh data, and you’re ready to start fixing The Motivator. Now that you’ve created your special Trailhead DE org, have a look at the app and make a copy of the dashboard you’ll be working with. Later, you’ll modify the dashboard according to the principles and ideas you learn during your design journey. 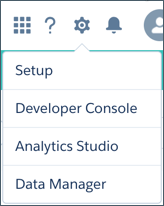 If you’re not already logged in to the Developer Edition org that you signed up for in the previous unit, log in and go back to Analytics Studio. In Analytics Studio, click the APPS tab. Click The Motivator to open the app. Clicks The Motivator 1 dashboard. At the top right of the dashboard, click the More ( ) button and select Clone in New Tab. A copy of the dashboard opens in edit mode in a new Analytics Studio tab. To save the copy, click the Save ( ) button. Enter the title My Motivator, and click Save. To view the dashboard, click the Preview ( ) button. Great! Now you’ve got your own version of the dashboard that you can work on later. Don't worry if your dashboards look a bit different from the examples here. 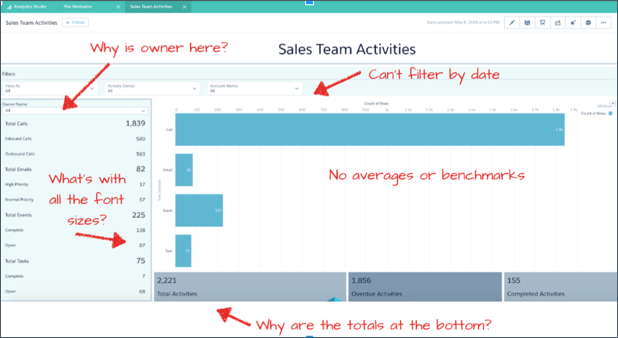 The basic elements of the dashboards should be the same even though the data may differ. You already scheduled time with the sales VP and her reports to show off The Motivator. You figure it’s a great way to break the ice, find out what they need, and let them poke holes at the dashboard, even in its preliminary state. Your goal from the meeting is to get enough information from the team to formulate a clear statement of purpose for the dashboard. The team’s excited to have such an energetic Salesforce admin. Team members chime in with their wishes. You’re glad to hear these requests, because The Motivator has some of that already. So you open up the dashboard. “Nice,” one of the regional managers says. “There’s a great bar chart, but…” And here it comes. One by one, folks around the room pick the dashboard apart. Great feedback! Some of it you noticed, too. 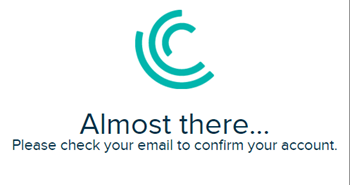 It’s great to have the confirmation and get input from the folks who’ll actually use the app. Of course it’s one thing to have gut-level responses from stakeholders, quite another to determine how they add up to great design. You have some work to do! You repeat back all the ideas and critiques to be sure you understand them. You put everything up on the whiteboard so you can take a picture of it. 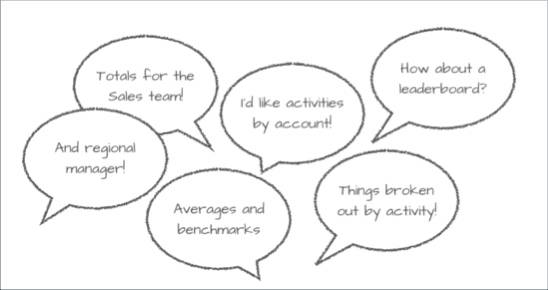 And with 5 minutes left, you ask if anyone wants to follow up with a session to whiteboard the dashboard of their dreams based on this initial feedback. Everyone’s excited to be part of the process, but a few members of the team seem to be particularly creative and vocal. So you end the meeting a little early and invite those folks to a follow-up session. You’ve completed the first step in determining your dashboard’s purpose: understanding your audience and its needs. Reflecting on that, you think you can clearly state the purpose. You drop that in an email to the team. Being an enthusiastic, engaged bunch, they get back to you right away with a big thumbs up! The team’s enthusiastic responses would be music to the ears of any designer. For an app to be useful for its users, you as the designer have to empathize with your audience. You have to understand their intentions, goals, and the actions they want to take. You have to feel their pain, and understand how your app can ease their pain. You’ve accomplished a major part of determining your app’s purpose. Next up: Translate what you’ve learned into a set of specific design requirements for features. You do that next, and even start fixing The Motivator. But first, answer these questions to make progress toward your App Design Basics badge.